Figure A58. Mayn anomaly, interpreted as the Mayn slab, with (horizontal) [vertical] cross sections through (A)[D] the UUP07 p-wave) and (B)[D] the combined SL2013 and S40RTS s-wave models at 310 km; C) the location of the modern geological record that we interpret to have formed during the subduction of the slab. Vaes et al. (2019) recently modified the interpretation that the Mayn slab is related to subduction below the Shirshov Ridge between 30 and 15 Ma, for which they found no compelling evidence. Instead, the slab is better correlated to short-lived northwest-dipping subduction below northern Kamchatka linked to ~450 km of NW-SE-oriented extension accommodated by seafloor spreading in the Komandorsky Basin, directly to the west of the Shirshov Ridge. The spreading is estimated to have occurred between ~20 and 10 Ma based on dated marine magnetic anomalies (Valyashko et al., 1993), leading to the subduction of pre-existing oceanic crust that floored the proto-Komandorsky basin (Vaes et al., 2019). Vaes et al. (2019) argued that the Shirshov Ridge instead formed between ~85 and ~60 Ma as part of the Olyutorsky arc (see Agattu slab), consistent with Late Cretaceous to Early Paleogene ages of dredged cherts and island-arc volcanic rocks (Baranov et al., 1991; Hauff et al., 2016), and broke off the Olyutorsky arc during the opening of the proto-Komandorsky Basin between ~60 and ~50 Ma. We follow the recent interpretation of Vaes et al. (2019) and adopt an age of ~20 Ma and ~10 Ma for the top and base of the Mayn slab, respectively. The Mayn anomaly (Figure A58) is located below northeastern Siberia in the upper mantle and uppermost part of the lower mantle. It is N-S trending and towards the south it touches the Bering Sea slab. It was previously imaged by Gorbatov et al. (2000) and Zhao et al. (2010). The tectonic evolution and upper mantle structure of the region leads us to interpret the Mayn anomaly as a separate slab. The location of the slab is consistent with subduction along the Shirshov Ridge in western Bering Sea. This ridge is generally interpreted to represent a Cenozoic intra-oceanic arc (Nokleberg et al., 2000; Chekhovich et al., 2012). 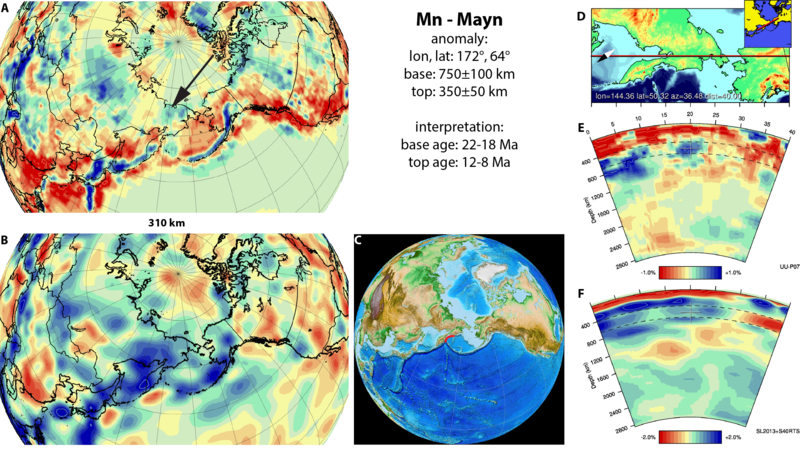 In the tectonic model of Chekhovich et al. (2012), the Shirshov ridge underwent to a period of imbricate thrusting between 30-15 Ma, which we adopt as the period of subduction.